09 MAY 2013 It was an evening of firsts as the Ottawa Main Mosque welcomed US Ambassador David Jacobson on his first official visit on April 8. 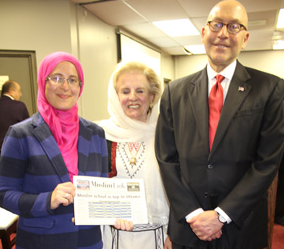 Subsequently Ambassador Jacobson was invited to visit the Ottawa Main Mosque by the Ottawa Muslim Women’s Organization, the Ottawa Muslim Association (which runs the mosque), and the Council of American Islamic Relations-Canada (CAIR-CAN), to engage in open discussion with the Muslim community. In his opening speech, the envoy outlined a number of programs and partnerships that his embassy had undertaken with Canadian Muslim organizations. These included helping to fund the Family Honour Project of the Muslim Family Resource Centre in London, Ontario and collaborating with the Association of Progressive Muslims on an exchange for young Muslim community leaders to the US. This is not the first time that Ambassador Jacobson has met with Canadian Islamic groups. In June 2011, he participated in a discussion with ten students during an open house at the new Muslim Youth Centre in northwest Calgary. The event was sponsored by the Muslim Council of Calgary that until last month was featuring highly anti-Semitic material on its website including accusing the Jews of “debauchery and immorality” and citing the notorious Czarist forgery The Protocols of the Elders of Zion. The Council on American Islamic Relations (CAIR) describes itself as “a grassroots civil rights and advocacy group and as “America’s largest Islamic civil liberties group.” CAIR was founded in 1994 by three officers of the Islamic Association of Palestine, part of the U.S. Hamas infrastructure at that time. Documents discovered in the course of the the terrorism trial of the Holy Land Foundation confirmed that the founders and current leaders of CAIR were part of the Palestine Committee of the Muslim Brotherhood and that CAIR itself is part of the US. Muslim Brotherhood. In 2008, the then Deputy leader of the Egyptian Muslim Brotherhood acknowledged a relationship between the Egyptian Brotherhood and CAIR. In 2009, a US federal judge ruled “The Government has produced ample evidence to establish the associations of CAIR, ISNA and NAIT with HLF, the Islamic Association for Palestine (“IAP”), and with Hamas.” CAIR and its leaders have had a long history of defending individuals accused of terrorism by the US. government, often labeling such prosecutions a “war on Islam”, and have also been associated with Islamic fundamentalism and antisemitism. The organization is led by Nihad Awad, its longstanding Executive Director and one of the three original founders.